As blossoms start to appear on the trees and afternoons go from frigid to comfortable, you know that the warmer seasons are right around the corner. Before you thaw completely from the chill-filled months that are now solidly in your rearview mirror, you need to prep your patio for the coming days spent outdoors. Fill your outdoor space with furniture and decor to help you fully enjoy the weather in comfort and style. 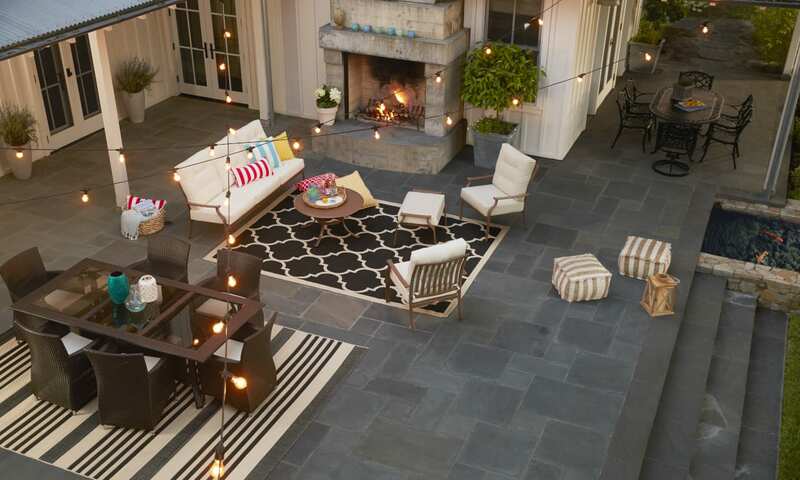 Read on for inspiring patio decorating ideas to kickstart those warm seasons of fun. Treat yourself to a resort-worthy staycation all summer long with a patio design that mimics the impeccable comfort of a luxury getaway. Your patio needs a distinct style that sets the mood with ambiance enhancing decor at every turn. Whether you’re channeling a boho-inspired retreat with colorful outdoor rugs and an excess of patterned pillows or a modern vacation spot by incorporating low-profile lounges in a grid-like arrangement, you can achieve the perfect resort style for your space. For tips on achieving your desired patio style, read Patio Design Ideas. 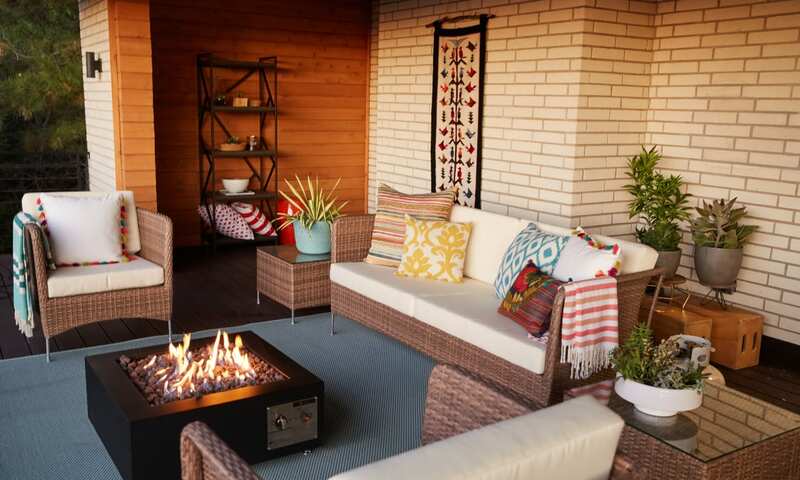 For a patio that feels intentional and cohesive, choose furniture and decor that determines the purpose of the space. You can divide your drool-worthy dinner spot from your relaxing seating area with space defining rugs. Hang overhead lighting above specific sections to differentiate between the activities intended for each. Petite patios call for small-scale design and multipurpose pieces to make the most of the available space. Outdoor poufs are a no-brainer. They seamlessly transition from ottoman to side table to extra seating. Get more small-patio inspiration from our guide on How to Choose Patio Furniture for Small Spaces. By giving your patio a distinct focal point, you are infusing it with a dose of personality that provides direction for the rest of the design. Whether it’s an outdoor fireplace, vibrant piece of art, or alluring water feature, a focal point determines the main gathering area in your space and implements a point of reference to use when coordinating decorative elements. Look to your focal point when choosing a color scheme, theme, or the general feeling you want to establish. You can get all the advice you need on choosing a focal point for your patio by referencing our guide, How to Create a Stylish Focal Point for Your Patio. The addition of an outdoor rug in your patio design promises barefoot comfort and decorative cohesion. 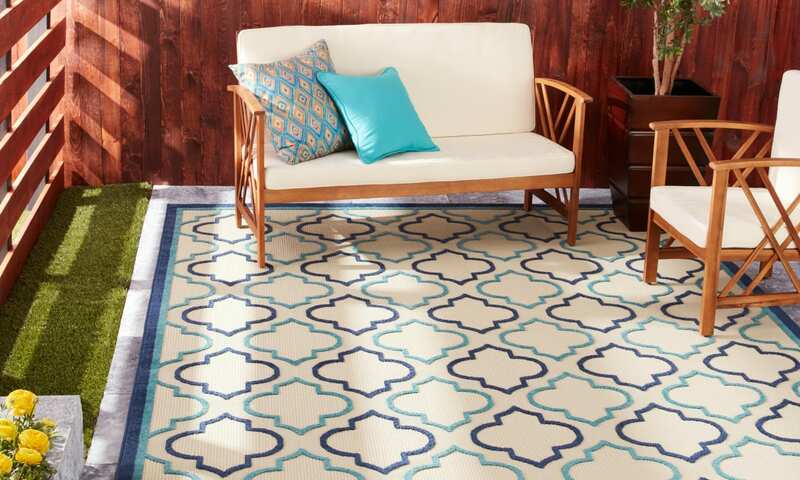 By imbuing your space with beautiful patterns and colors, a rug can be the focal point that ties your patio arrangement together. 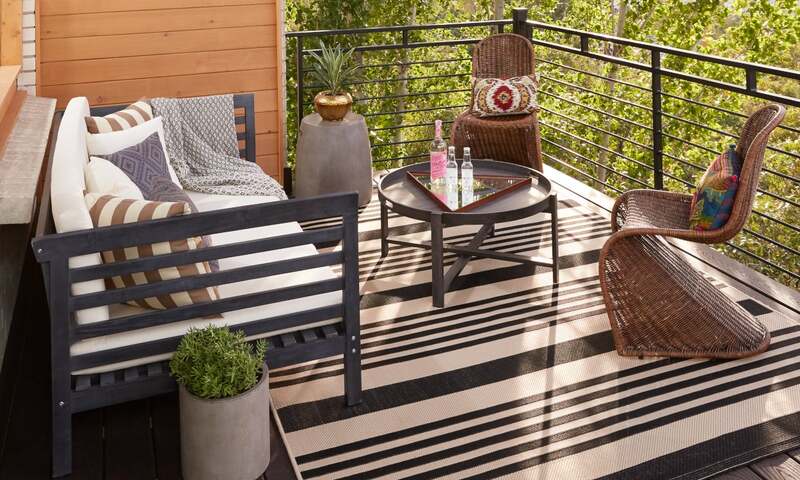 Choose a rug that coordinates with outdoor cushions and throws to ensure a matching look. A colorful rug can assist you in determining a color palette while a patterned monochromatic rug serves as a subtle statement piece. For tips on choosing the right rug size and style for your patio, read The Complete Rug Buying Guide. A splash of color in the form of plants and flowers gives your patio a put-together feel that most people only dream of. Pair that with the stylish dimension of decorative planters and you have an outdoor look that is steeped in panache. Look for planters that display your chosen outdoor style to enhance the design. The right planter can serve a variety of purposes on your patio, from eye-catching conversation starter to fragrant accent for a seating arrangement. Check out our guide on The Best Outdoor Planter Ideas to choose the perfect one for you. Usher your outdoor parties from dusk into night with accent lights that illuminate the space without sacrificing ambiance. 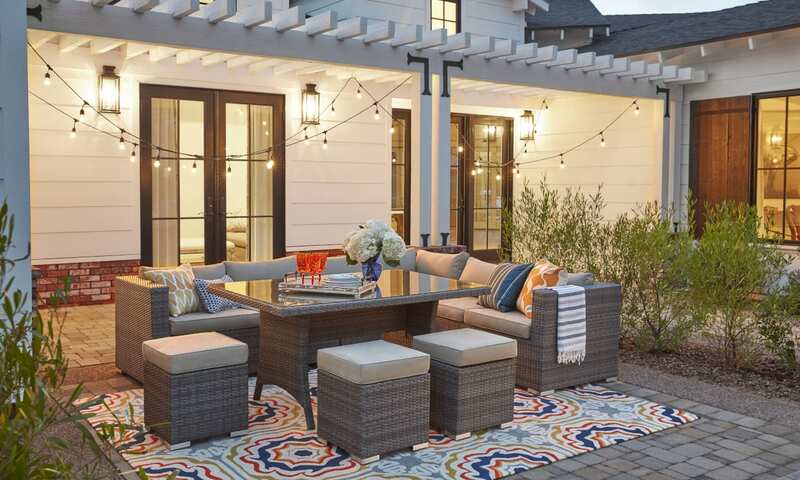 Hang string lighting with Edison bulbs over your patio for a soft glow that evenly brightens the area, or arrange lamps on side tables for more control over the intensity of the light and the areas you want to feature. Your patio can maintain an evening-ready setup every night with a decor-enhancing outdoor chandelier. Hang it above the patio table and establish a space to enjoy outdoor dessert for the whole summer. Our guide on Outdoor Lighting Ideas will help you select the best lights for your entire yard. An outdoor oasis isn’t complete without a level of seclusion. Relief from nosy neighbors and prying passersby assures a degree of comfort that’s otherwise unobtainable. 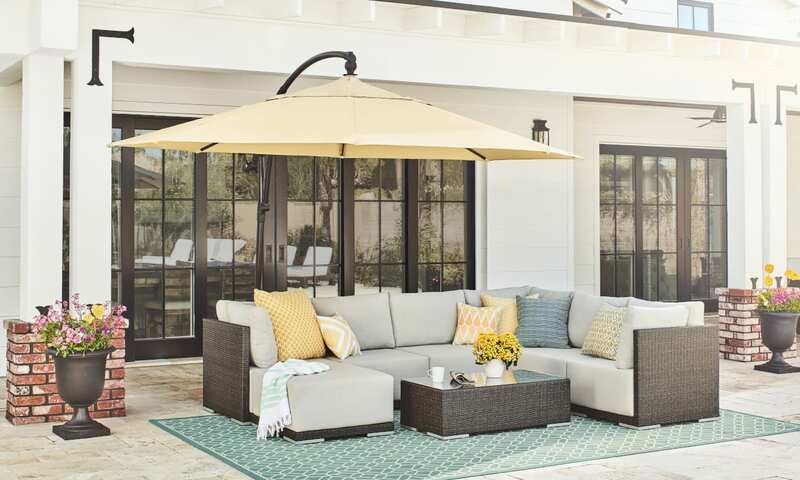 Start simple with a patio umbrella that shields you and your loved ones from the harsh rays of the sun and the eager eyes of the block. With the variety of size and tilt options available, your umbrella can do both. For tips on How to Choose the Best Umbrella for Your Patio, read our descriptive guide. You can amplify your backyard solitude with privacy screens or outdoor curtains that help you create a defiantly private space. Use our guide on Patio Privacy Ideas to choose the best option for you.